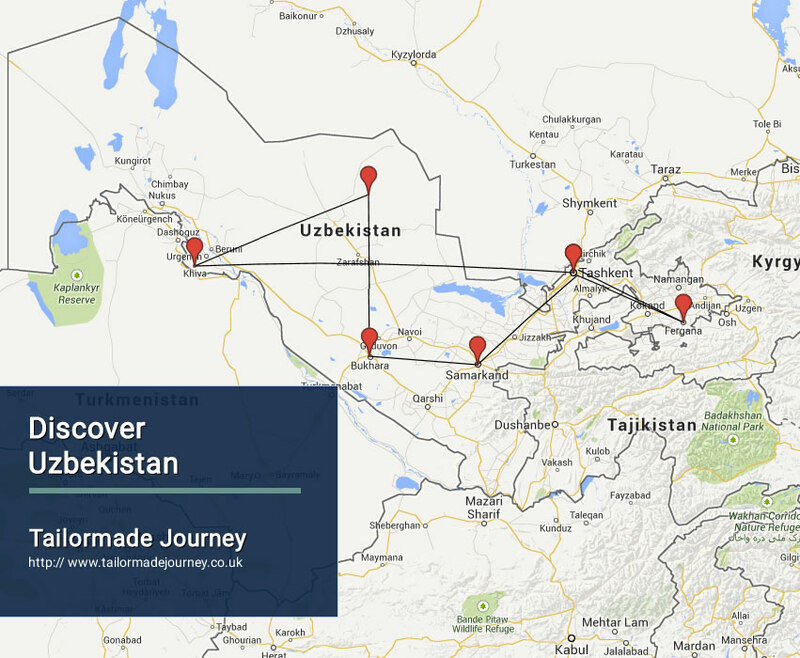 Starting from the Capital City of Uzbekistan this tour takes you through the Silk Road of the Uzbekistan. Arrive Tashkent 1 Night > Flight & Drive Khiva 1 Night ( Museum ) > Drive Kizil Kum Desert ( Red Sands ) > Drive Bukhara 2 Nights > Drive Samarkand 1 Night ( Madrassahs ) > Drive Tashkent 1 Night > Drive Fergana 2 Nights ( Rishtan ) > Flight Tashkent 1 Night & Leave. Upon arrival in Tashkent Airport you are met and transferred to your pre booked Hotel. Afternoon Half day city tour of Tashkent visiting the old town to see Barak Khana Seminary, Tila Shaikh mosque and archives known for the exhibit of a rare copy of Koran written the third Caliph Othman. Later proceed to Chorsu bazaar, Kukeldash Madrassah. Morning you are transferred to Tashkent Airport to board flight for flight Urgench. Upon arrival in Urgench airport you are met and transferred to Khiva. Upon arrival in Khiva check in at your pre booked Hotel.Note – Khiva is the museum under the open sky. In the inner city Ichan Kala no transport, whole day will be just walking tour.Visit Ichan Kala, Kalta Minor, Kunya Ark, Madrassah Rakhimkhon, Mausoleum of Pakhlavan Makhmud, Islam Khodja minaret and enjoy view of whole ancient Khiva, Friday mosque and Tashauli Palace/harem.Overnight stay at the Hotel in Khiva. Morning drive to Bukhara via famous Kizil Kum desert (Red sands) See Desert Flora and Fauna unique saksaul trees and other desert vegetation, different kind mammals. Stop at Amudarya river bank. Later proceed to Bukhara. Upon arrival in Bukhara check in at your pre booked Hotel. Overnight stay at the Hotel in Bukhara. After breakfast full day sightseeing tour of Bukhara visiting Lab-i-khauz ensemble, the pool and chaikhana of which is the modern centre of traditional Uzbekistan. Visit Madrassah Nadirkhon Devanbegi, Khanaga, Mogaki Attari mosque, Poi Kalon minaret and mosque. Later see Madrassahs Aziz Khan and Ulugbek. Afternoon visit Ark Fortress, Balakhauz mosque, mausoleum of Ismail Samanid, Chashma Ayub. Dinner with optional Folk show at Nodirkhon Divanbegi Medrassah. Morning leave by surface for Samarkand en route visit Gijduvan – center of famous hand made ceramic, See the process of making this unique ceramic and local life of the small town. Afternoon proceed to Samarkand. Upon arrival in Samarkand check in at your pre booked Hotel. Later half day sightseeing tour of Samarkand visiting Registan Square which was for many centuries the heart of Samarkand. See the three beautiful madrassahs: the Ulug-Bek Madrasah built in the fifteenth century; the Tillya-Kori Madrasah built in the seventeenth century; the Sher-Dor Madrasah, also built in the seventeenth century. Visit Gur Emir – mausoleum of Great Tamerlane. Overnight stay at the Hotel in Samarkand. Morning half day sightseeing tour in Samarkand See the grandest structure of Amir Temur’s times is the chief Friday Mosque called Bibi-Khanum, the Silk Road bazar and Shahi Zinda necropolis. Afternoon drive to Tashkent. Upon arrival in Tashkent check in at your pre booked Hotel. Overnight stay at the Hotel in Tashkent. Morning drive to Fergana en route visit Dangara village – house of woodcarving master. See unique ancient (more then 200 years old) woodcarving ornaments. You will have opportunity to carve yourself some ready made designs on the walnut pieces of wood. Visit Kokand. Excursion to the major sights: Khudayar Khan Palace, Jommi Mosque, Narbutabey and Dasturkhanchi Madrassah, Royal Cemetery and Khaidarov Workshop (museum of Kokand woodcraft). Upon arrival in Fergana check in at your pre booked Hotel. Overnight stay at the Hotel in Fergana. Today full day sightseeing in Fergana valley visiting Rishton – center of unique ceramic production in Uzbkekistan. Rishtan is known today as a city of the foremen, one of the largest in Central Asia centers of manufacture of unique glazed ceramic. Rishtan artisans have become famous all over the world for their ceramics production technology. Their distinctive blue and green work shines in the sun, and every third family in Rishtan produces pottery. All works are unique. Around the turn of the century about 250 artisans worked in Rishtan. Visit workshop. Afternoon visit Margilan to see whole process of hand made silk production at famous Yodgorlik factory. Locating in south-east of Fergana Valley, Margilan is considered to be one of the ancient cities in Uzbekistan and Central Asia, as well as a big centre of international trade. The caravan routes connected Europe with the East Asia via Margilan. From time immemorial, population of Margilan was busy with manufacturing beautiful silk fabrics making thus Margilan city well-known all over the world. Early morning you are transferred to Fergana Airport to board flight for Tashkent. Upon arrival in Tashkent Airport you are met and transferred to your pre booked Hotel. Afternoon excursion to Mustakillik (Independence) Square in the heart of Tashkent and famous Tashkent Metro (underground) decorated with local marble and granite like an underground palaces, visit Amir Temur squire, Opera Navoi Theater squire. Today you are transferred to Tashkent Airport to board flight for Onward Journey. Club Hotel 777 is located in Fergana city, the center of the Ferghana Valley, about 3 km from the airport. It is elegant and hospitable private hotel, built in small business hotel style, which offers comfortable rooms, nice restaurant with bar, sauna, billiards, and conference rooms. There is a beatuiful spacious inner courtyard with green lawns and beautiful flowers. Best of all, there is an illuminated outdoor pool with summer restaurant where guests can relax day and night after their journey in the Ferghana Valley. Guest can use the tennis court located next to the hotel. Located in the centre of the ancient city of Samarkand, Grand Samarkand Superior Hotel features a rooftop swimming pool with a sun terrace and loungers. The classic-style, air-conditioned rooms of this hotel offer elegant, warm-coloured interiors with white brick walls. All rooms come with a flat-screen TV, a refrigerator and a private bathroom with bathrobes and slippers. Grand Samarkand Superior Restaurant is decorated with traditional Uzbek rugs and serves Uzbek and European cuisine. A wide range of wines and fine drinks is offered at the bar. After a day of sightseeing guests can have a massage, relax in the Finnish sauna and swim in the indoor pool. Set in the heart of Samarkand, this hotel offers European cuisine, a garden and free Wi-Fi in public areas. The Old Town district and Registan Square are within a 10-minute drive. Rooms at the Grand Samarkand offer satellite TV, a minibar and a work desk. They are warmly decorated in a traditional Uzbek style, and include a private bathroom with a hairdryer. The classically decorated restaurant features an antique piano, and offers a rich variety of à la carte European and Uzbek dishes. A range of drinks and cocktails are also served in the bar, which overlooks the quiet courtyard. The Guru Amir Mausoleum is 2 km away, and it is 750 m to the International Museum of Peace and Solidarity. Malika Bukhara is a 4-star hotel offers a spa centre and rich breakfast buffet with national and European dishes. WiFi is available throughout the property. Elegant rooms with classic-style décor are offered at the Malika-Bukhara Hotel. Rooms feature a flat-screen TV, air conditioning and a minibar. National and Western cuisine is served in the restaurant of the Malika-Bukhara Hotel. A wide variety of drinks is offered at the on-site bar. The spa centre features Rusian and Turkish sauna and guests can use fitness centre. Boutique Hotel Minzifa is situated in Old Bukhara, the traditionally decorated hotel is 150 m from Lyabi-Hauz Architectural Complex. Colourful, eastern-inspired rooms at Hotel Minzifa feature traditional Uzbek embroidery. They all include a flat-screen TV, refrigerator, and air conditioning. Breakfast is available in the hotel's buffet restaurant. It serves regional Uzbek and European dishes. Guests can also enjoy drinks at the bar in the hotel’s courtyard. Located in the Old Town district, the hotel is a 15-minute walk from The Ark Fortress. Hotel Ramada is located in the city centre of Tashkent, a 15-minute walk to Independence Square, Ramada Tashkent features an indoor swimming pool, a sauna, a spa centre, a fitness centre, and an on-site restaurant and bar. Free Wi-Fi and free private parking are available. Rooms at the hotel offer a TV with satellite channels, a minibar, an electric kettle, a seating area, a safety deposit box, air conditioning, and a private bathroom. Other property facilities include a 24-hour front desk, billiards, a tour desk, a snack bar, meeting and banquet facilities, luggage storage, and an airport shuttle. Pakhtakor Markaziy Stadium is a 15-minute walk from the hotel, Tashkent Tower is 4 km, and Tashkentland is 3 km away. Gafur Gulam Metro Station is a 20-minute, Tashkent Train Station is 5 km away, and Tashkent International Airport is 8 km from the property.